Share your bad beats in this thread - name the site if you want to. I know I'm not the only one getting bad beats. I have and I raised 5 x BB. The player at BB calls and we are the only 2 players in the hand. BB checks. I check. I'm trying to sucker him in to thinking I don't have the ace. The turn is . BB checks and I bet the pot. BB calls. The river comes: . BB bets all in and I call. He showed his hand which was . 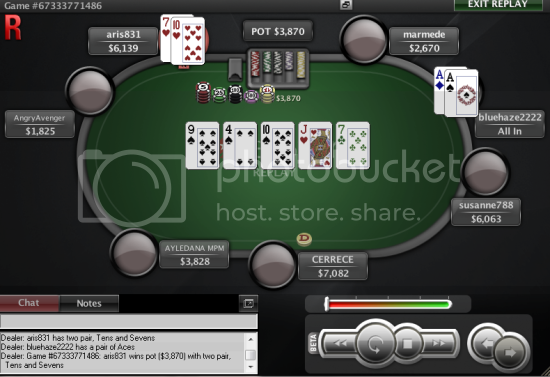 I was livid when I saw his 9 and to think he called a largish pre-flop raise with 93 off. What a fish. Tell us your bad beats. I raised 6 times the BB and the "calling station" of course throws his chips in and calls. After the flop, I just went all in and he called again. As you can see, he got lucky on the river. So typical of PS. If you look in the picture, you can just see my opponent's "circle" round his seat is red. That would be because I made some notes on this player. He is poor poor poor. Called out of position with Q3 off suit. I think that when there are calling stations on the table, I definitely need to be more bold with great hands like AA and just go all in from the off. I would rather just take the blinds than get beaten by a donkey like that. I'll tell you about my expierence. I had TPTK on the flop, I checked and than miniraised, opp call. turn K, I didnt believe that he has K but I checked, after opp's bet (he raised too much in my opinion) I went allin. he called, I had AQ and Q on the flop and he showed 66, gotcha I thought. river 6.. I play NL10, I didnt lost a lot but..
Ouch i agree that hurts Malika! My worst bad beat was when i had a pair of twos in my hand and the board flopped a 2 for three of a kind along with an ace. My opponent raised me on the flop and i was certain he had the ace. Of course i matched his bet but didn't want to scare him off just yet by re-raising. On fourth street another 2 comes out giving me quad twos! I was a sure winner ( i thought) when he bet and i went all in. Turns out he had pocket Aces and was looking at three of a kind while i had four of a kind. By the way welcome to the forum too! I think we should start a badbeat club!! wink..wink!! Those were really unlucky hands Malika9 and Lips. Welcome to the forum Malika. OMG blue! That is the absolute worst!!! I would have been howling and probably buying a new computer after a thing like that! I think it has to be the worst bad beat ever.....ever. I would chuck the computer at the wall I think. I wouldn't give up the game though. For once I was the one doing the BEATING! I was playing in a SNG tourney and the chip leader was smooshing everyone including me on every hand. I was getting nothing and more nothing... watching my already smooshed stack dwindle when I got KK! Finally, something to play so i throw my decimated stack all-in... But of course the chip leader called while everyone else folded and he flipped AA. My heart sank. Well, nothing for it, but to let the hand unfold before us. Flop 9 J Q, no help. Turn another Q, still no help, I'm folding up my tent ready to finish with a whimper... River is a ..............................drum roll please.................10! After that I was unstoppable and ended in 1st place! 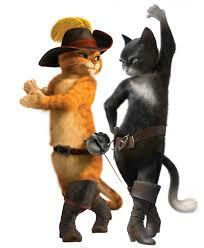 Yeeee and Hawwwww! Very nice Katt. Don't you just love to love that river sometimes. Congrats on a great win.